Original Christo’s has been a staple of the Lexington, NC, food scene since 1983, and they’re still the best family restaurant around. The great eats and friendly atmosphere have made it a popular choice for locals and tourists alike. Just check out their menu and you’ll see that there’s a little something for everyone. They might be best known for their unbelievable wings and freshly baked pizza, but Original Christo’s also offers a great menu of fully loaded sub sandwiches, classic Italian pasta dishes, burgers, and a full salad bar with all the fixings. The family restaurant also has lots of fun appetizers like mac and cheese bites, potato skins, and, of course, stuffed jalapeño poppers with cheese! There’s also a date-worthy dinner menu and an affordable kid’s menu, so no matter what the occasion is or who you’re with, you can count on Original Christo’s to have something everyone will love! There are plenty of family restaurants in the Lexington area, but the minute you walk through the doors of Original Christo’s, you can tell you’re in a fun and friendly neighborhood eatery. Stop by any night of the week and you’ll see that the bar is always fully stocked with ice-cold beer, the game is always on, and the pizza and wings are always up for grabs. There’s also plenty of regular seating so that you can stop by Original Christo’s for game night, girls’ night, or family night! It doesn’t matter if you’re settled in at the bar placing a 100-wing order for your new friends (that’s right, you can order 100 wings at a time), or you’re in the dining area enjoying a nice family dinner — you’ll always have a memorable experience. If you’re not in the mood to go out, that’s OK too! 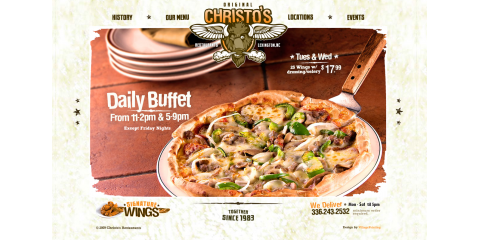 Original Christo’s offers easy delivery for those nights when you just want to hang out at home. Check out their menu online and give them a call at (336) 243-2532 to place your order.